Peterborough-born David Clarke will go down as one of the top British players to ever play the sport and in the last two decades won a host of trophies and medals to go with a glittering career for club and country. The Nottingham Panthers and Great Britain international forward retired in April 2018 as not only the Elite League’s all-time leading goalscorer, but the league’s all-time leading points-scorer – two records that may take a long time to be broken again. His record speaks for itself – games 764 (ranked seventh), goals 370 (ranked first), assists 361 (ranked fourth) and points 731 (ranked first). After beginning his career with his home-town club, Clarke spent the majority of his time with the Nottingham Panthers in the top flight of British ice hockey. He first iced for Peterborough as a 15-year-old in the British National League (BNL) and spent four years with the Pirates, scoring over 100 points. His impressive displays caught the eye of the Newcastle Jesters of the Superleague (ISL), who signed him up for the 2000-01 season. Clarke was one of a minority of British players to make an impact in a league dominated by imports. The forward also had spells with London Knights (ISL), Guildford Flames (BNL) and Milton Keynes Kings (BNL), before arriving in Nottingham for the inaugural year of the Elite League. Clarke won a trophy in his first season with the Panthers and scored the first goal in Nottingham’s two-legged Challenge Cup final victory over arch rivals Sheffield Steelers. He scored at a point-per-game throughout his career at National Ice Centre and captained the Panthers to their first play-off championship title for 18 years in 2007. He again scored Nottingham’s first goal – this time in the play-off final against Cardiff Devils – a game Panthers went on to win on penalty shots. 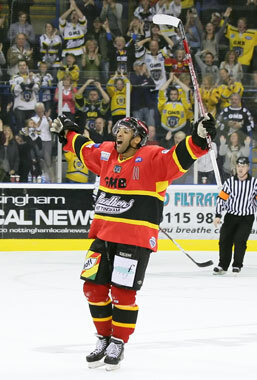 Clarke spent a season in Italy’s top fight with HC Alleghe in 2007-08 and then returned to his second home to chase more honours with the Panthers. He was made alternate captain on his return in 2008 and by the end of the season had been named on the starting line-up for the Elite League all-star team. Clarke helped Panthers win the Challenge Cup in 2009-10, scoring the vital game-winning goal in an 8-7 aggregate victory over Cardiff. Clarke was also part of the Nottingham Panthers side that won the play-off and Challenge Cup in 2010-11 – the first side to complete the cup double in the history of the Elite League. He scored in the first leg of the two-legged Challenge Cup final success against Belfast Giants . Clarke made his own history in December 2011 when he scored Nottingham’s fourth goal in a 9-3 victory in Hull to pass Adam Calder’s record of 229 Elite League goals. Panthers then repeated their remarkable double in the 2011-12 season as Clarke added two more trophies to his collection. He scored in both the first and second legs of a 10-4 aggregate victory over Belfast in the Challenge Cup final and netted the second goal in the playoff final victory against Cardiff. In 2012-13, he helped Nottingham end their 57-year wait for a league title and scored in the title-clinching game at Belfast. He also helped Panthers complete a famous treble as they lifted the Challenge Cup by beating Sheffield over two legs – and they also won the playoffs again as Clarke assisted on Jordan Fox’s game-winning goal in the 3-2 victory over Belfast. Clarke was named as Panthers captain for a second time starting in the 2013-14 season and he led the club to a fifth successive Challenge Cup title as they produced a remarkable comeback over two legs to beat Belfast on penalty shots. In 2014-15, he captained Nottingham in the inaugural season of the Champions Hockey League (CHL) and helped the Panthers lift the Erhardt Conference title, while a season later he was part of another double-winning Nottingham side. Panthers lifted the Challenge Cup with an overtime victory over Cardiff in the 2015-16 season in the new format of a one-off final at the Sheffield Arena, while he assisted on the first goal as Nottingham beat Coventry 2-0 in the playoff final at the NIC. He was appointed player assistant coach in 2016-17 and played his part on and off the ice as the club became the first UK side to win a European trophy. Panthers lifted the Continental Cup in January 2017 and although Clarke was unable to play in the latter stages of the competition because of injury, he was part of the coaching staff when they secured the European title in Italy. In his final season of professional ice hockey, the 2017-18 campaign, Clarke helped Panthers create a stir across Europe. Nottingham won four of their six group games in the CHL – ice hockey’s equivalent of football’s Champions League – to become the first UK team to reach the knockout stages of the prestigious tournament. In January 2018, Clarke become the league’s leading points-scorer on a very special night at the National Ice Centre in Nottingham. He assisted on a goal by Ollie Betteridge – a protégé of the Clarke & Co Hockey School – to take his points tally to 712 and pass Ashley Tait. Clarke has been leading British goalscorer in the league seven times (2004-05, 2006-07, 2010-11, 2011-12, 2012-13, 2013-14 and 2015-16) and was also named as Best British Forward three times. Clarke was a regular in the Great Britain set-up since 1999 making nearly 100 appearances for his country, including winning a gold medal, three silver and two bronze medals. His final act as a GB player was to help them to promotion to Division 1 Group A of the World Championship structure as he scored six points in five games in Belfast as Britain went undefeated to win the gold medal. After Clarke announced his retirement from the sport, the Panthers revealed they would retire the #5 shirt and he became one of only six players to have this honour bestowed on him by the club.